University of Texas at Austin researcher Steven Phelps is examining these unconventional rodents to gain insights into the genes that contribute to the unique singing behaviorinformation that could help scientists understand and identify genes that affect language in humans. "We can choose any number of traits to study but we try and choose traits that are not only interesting for their own sake but also have some biomedical relevance," said Phelps. "We take advantage of the unique property of the species." The song of the singing mouse song is a rapid-fire string of high-pitched chirps called trills used mostly used by males in dominance displays and to attract mates. Up to 20 chirps are squeaked out per second, sounding similar to birdsong to untrained ears. But unlike birds, the mice generally stick to a song made up of only a single note. "They sound kind of soft to human ears, but if you slow them down by about three-fold they are pretty dramatic," said Phelps. Most rodents make vocalizations at a frequency much too high for humans to hear. But other rodents typically don't vocalize to the extent of singing mice, which use the song to communicate over large distances in the wild, said Andreas George, a graduate student working in Phelps' lab. Within the last year Phelps research on the behavior of the mouse has appeared in the journals Hormones and Behavior and Animal Behavior. But one of his newest research projects is looking deeper: examining the genetic components that influence song expression. Center stage is a special gene called FOXP2. "FOXP2 is famous because it's the only gene that's been implicated in human speech disorders specifically," said Phelps. The FOXP2 gene is remarkably similar overall between singing mice, lab mice and humans, said Phelps. 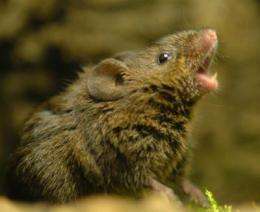 To find parts of the gene that may contribute to the singing mouse's songs, Phelps is searching for sequences unique to the singing mouse and testing them for evidence of natural selection, which weeds out mutations with no likely observable effect from those that are likely to contribute to singing behavior. "Those two things go a long way," said Phelps, " And when you look at the intersection of those two things they give us a really good set of candidate regions for what might be causing species differences." Most genetic mutations don't cause serious problems. They are often a part of the genome that is not expressed, still make a functional product, or are simply drowned out by the amount of genes and gene products that are working correctly. FOXP2 mutations, on the other hand, can have significant effects on speech because of the gene's role as a transcription factora gene product that helps control the expression of other genes. Phelps and his team are figuring out what activates FOXP2 expression and the genes that are expressed after its activation by playing singing mice recording of songs from their own species and neighboring species and observing the gene expression patterns. "We found that when an animal hears a song from the same species, these neurons that carry FOXP2 become activated. So we think that FOXP2 may play a role in integrating that information," said Lauren O'Connell, a post-doctoral researcher in the Phelps lab. "We ask two things, whether there are sequence changes in the DNA that are associated with the elaboration of the song and whether particular elements seem to be interacting with FOXP2 more," said Phelps. "That gives us leads into what role FOXP2 might play into the elaboration of vocalization." Phelps' uses next-generation sequencing to decipher how FOXP2 interacts with DNA to regulate the function of other genes. The process involves reading tiny fragments of overlapping DNA so that the entire sequence can be deduced. It is a procedure that generates massive amount of data that only the processing power of a supercomputer can handle, said O'Connell. "You need TACC to do it," said O'Connell, referring to the Texas Advanced Computing Center, which houses the supercomputers the lab uses. "The more data you have, the more memory it requires, so a lot of the data we can only process on Lonestar's high memory nodes." At the most basic level, Phelps' research is asking questions about the biology and behavior of an exotic rodent. But finding out more about the link between FOXP2 and the song of the signing mouse could bring a better understanding into how the gene may contribute to language deficits in people, especially those with autism, said Phelps. "When people do genome wide association studies in humans the genetic variation tends to occur in huge blocks. So if you get some DNA sequence that predicts a phenotype, like risk for autism, it's very hard to know what aspect in this very long stretch of DNA is actually important for that," said Phelps. By identifying the sequences of DNA that interact with FOXP2 and other associated genes that are most vital to gene function, researchers in the future might be able to narrow down the "huge blocks" where a possible causal sequence is located into smaller pieces. In other words, reducing the size of the metaphorical haystack to a size where finding the needle is a much simpler task. While a singing mouse may seem like a strange place to look to study the impact of genetics on language, O'Connell says that the advent of gene sequencing technology is allowing a whole menagerie of animals to be used for research that could later be applied to humans. "I use TACC to sequence a lot of different animals: birds and fish and frogs and mammals and beetles," said O'Connell, mentioning the other organisms she studies outside of the Phelps lab. "Each of these model systems has something unique to contribute that teaches us about biology that is still applicable to humans."